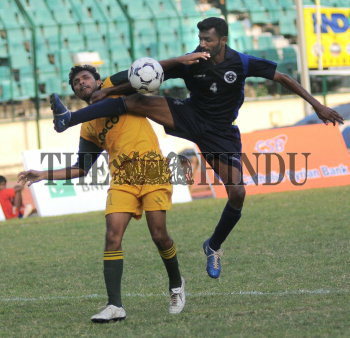 Caption : CHENNAI ; 19/08/2010 : Mohammed Mouzam (left) of Andhra X1 and Srinivasan of Chennai ICF fighting for the ball during the V.P. Sathyan Memorial All India football tournament at Nehru Stadium in Chennai on August 19, 2010. Photo : M_Vedhan.